Camping, whether it is going the rugged route and pitching tent or enjoying some of the comforts of home in an RV or cabin, it is one of the best ways to get outdoors and away from technology. For this next trip, you’d like to bring the family dog along, but if the closest thing to an outdoor expedition has been a trip to the dog park, you might want to do a little prep work first. While camping is fun, dogs are curious creatures, and sometimes that nose can get him into trouble. 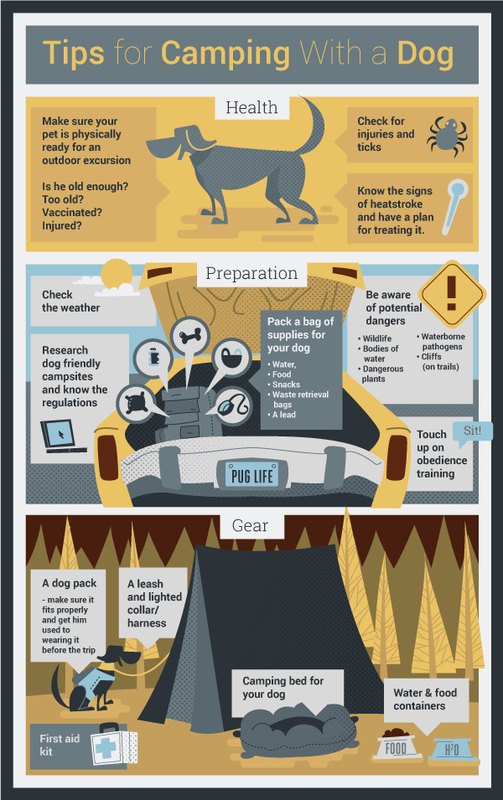 Check out the info graphic below to ensure your camping trip with your dog is a barking success. Your dog will surely enjoy a camping trip with you, just make sure the two of you stay safe. After this trip, a day at the dog park just won’t do for Fido.